Come build your dreams and make them real. Lay the foundation for your family’s dream home at Villa Antonella. 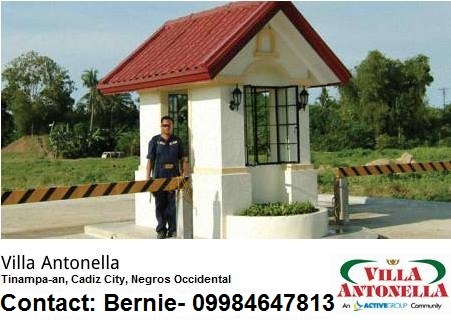 Conveniently located along an access road at the northern section of Cadiz City, just a few meters away from the National Highway and it’s right within the coverage area of the expansion of the local water system. One of the Economic & Socialized Housing projects you can take advantage located in Tinampa-an, Cadiz City, Negros Occidental. We are also specializing House and Lot for Sale! - Lot area: 96 sqm. - Lot Area: 192 sqm. - Lota Area: 192 sqm.